VICE News reporter Medyan Dairieh embedded with the terrorist group known as ISIS, ISIL and now just Islamic State, for three weeks and in the video below Abu Mosa, a spokesman for the terror group states "I say this to America, that the Islamic Caliphate has been established. And we will not stop. Don't be cowards and attack us with drones. Instead send your soldiers, the ones we humiliated in Iraq. 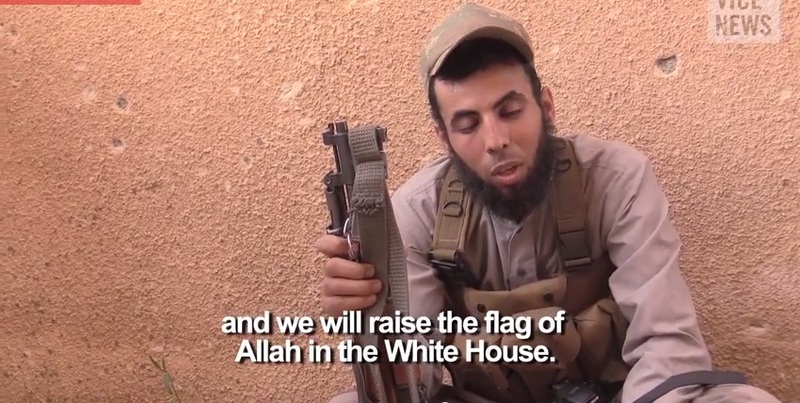 We will humiliate them everywhere, God willing, and we will raise the flag of Allah in the White House." Mosa's statement to America starts at the 4:40 minute mark in the VICE video below, but the entire video is a must-see to understand the depths of evil we face. Evil we have allowed to thrive to the point where they now control significant parts of Iraq and Syria. In the second video below, former Army General Barry McCaffrey is "dismayed" by the Obama administration's "muddled thinking" in regards to the decisions being made now on what to do about Iraq and ISIS.